Working in a remote, north-west corner of the Simpson Desert, on land annexed by pastoral leases during the 1920s, Emily Kame Kngwarreye became, in the final decade of her life, perhaps the most celebrated and sought after Australian artist of her time. A leading figure in eastern Anmatyerr ceremony, Kngwarreye was also the artist in whose work many white Australians first felt the force of an Indigenous art that could be seen to negotiate a space both within the aesthetics of Western abstraction and the timeless precepts of Aboriginal cultural traditions. Kngwarreye's 'Untitled (Alhalker)', 1992, has been perceived as a lyrical mapping of country, a poeticising of the desert in bloom, or simply as a spectacular abstract painting. Alhalker, the desert country of Kngwarreye's birth, is anchored by a sacred rock in the form of a spectacular arched monolith, and shaped by the vagaries of the harsh desert environment. 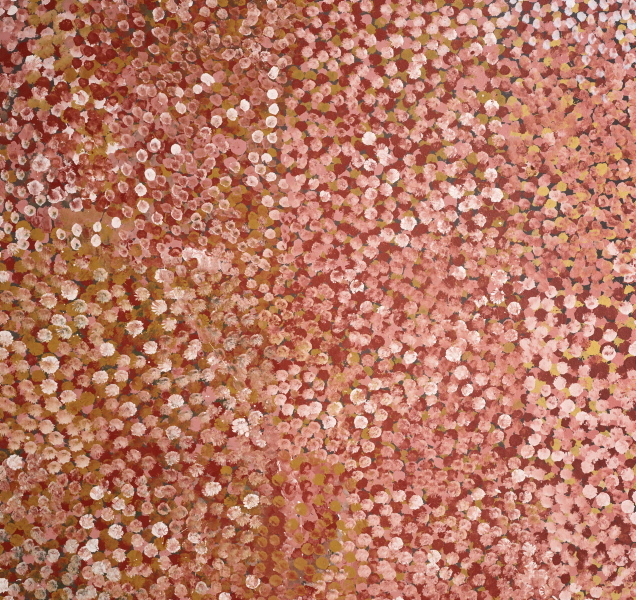 From the beginning, Alhalker remained the means and end of Kngwarreye's art. 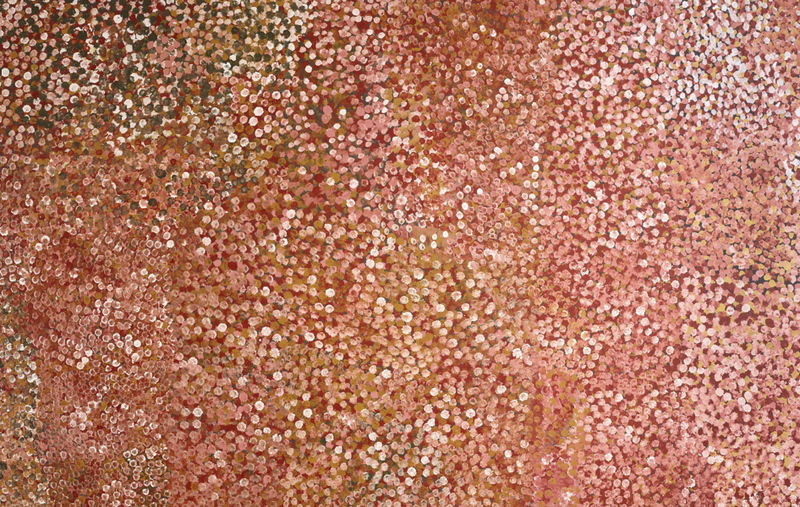 Kngwarreye attained artistic maturity as a woman in her seventies, not long converted to the techniques of painting on canvas, but with decades of painting in a ceremonial context and activity with the Utopia Women's Batik Group behind her – as well as life as a camel handler and stockhand. In an extraordinarily prolific eight years of professional painting, she produced magnificent canvases in which she appears to have aimed for essentialist visions of the multiplicities and connectedness of her country, as imaged in terms of its organic energies. Kngwarreye's vital traceries both conform to, and seem to expand beyond, her clan codes, in abstractions of ceremonial markings and imagery of her country's flora and fauna. During the early 1990s, Kngwarreye developed a painting technique that literally embodied her sense of the explosive, yet ordered, rhythms of the natural world: she energetically worked her canvas with fluid dots or blobs of colour that formed a pulsing layer over the 'mapped-out' underpinnings of her paintings. Later, she embraced the austerities of stripe compositions in works such as 'Untitled (Awely)', 1994, and in seething, linear 'yam Dreaming' paintings, before she created the remarkable blocky gestural abstractions of 1996, the final year of her life. 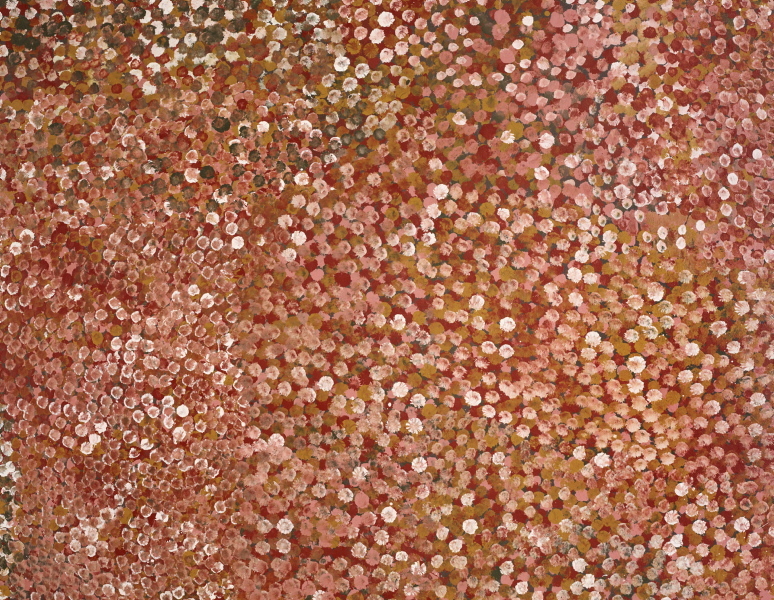 Deborah Edwards, Tradition today: Indigenous art in Australia , 'Emily Kame Kngwarreye', pg. 58, Sydney, 2004, 58, 60-61 (colour illus.). Deborah Edwards, One sun one moon: Aboriginal art in Australia , ‘Histories in the making: Aboriginal Art and modernism’, pg. 51-63, Sydney, 2007, 54-55 (colour illus.). Bruce James, Art Gallery of New South Wales handbook , 'Australian Collection: Aboriginal and Torres Strait Islander Art', pg. 208-241, Sydney, 1999, 232 (colour illus.). AGNSW Collections , 'From Colonialism to late Modernism', pg. 7-106, Sydney, 1994, 103 (colour illus.). Yiribana , Sydney, 1994, 13-14 (colour illus.). Hetti Perkins, Art + soul: a journey into the world of Aboriginal art , 'Dreams + nightmares', pg. 88-153, Carlton, 2010, 150 (colour illus., detail), 151 (colour illus. ), 281. Judith White, Look , 'Farewell Jill', pg. 22-23, Sydney, Feb 2015, 22-23 (colour illus. ).